Arnold spent the first half of May in Kenya and Tanzania, and returned with some beautiful gems to add to the AJS Gems collection: fine tsavorite garnet, tanzanite, Mahenge spinel, rhodolite, spessartite and color-change garnet, and chrome tourmaline. Most of the material is in rough form and we'll be busy cutting it over the next few months. But we also have some finished pieces that we've already added to our website (see this month's Notable Gems). In the last 20 years, East Africa has become the leading source in the world for colored gemstones. This gem-rich region extends from Ethiopia in the north down through Kenya, Tanzania, Mozambique and the huge island of Madagascar. Geologically, this area is known as the Neoproterozoic Mozambique Belt. 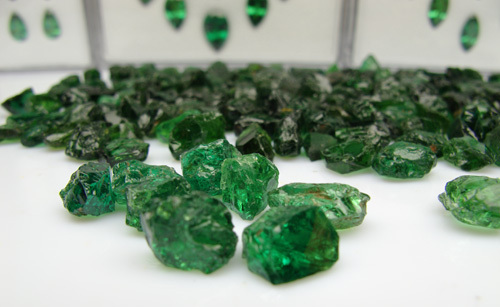 It contains the world's only supplies of tsavorite garnet and tanzanite, as well as fine sapphire, ruby, spinel, tourmaline, aquamarine and opal. 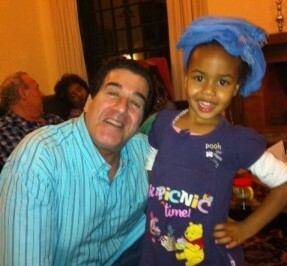 But the world demand for these rare gems far exceeds the supply. With new demand from emerging economies such as China, it has become harder to source high quality material. While every kind of colored gem is available in the Bangkok market, finding top grade stones here at realistic prices is increasingly difficult even for well-connected dealers. So it makes sense to buy close to the source. But buying in the producing countries is far from easy. In fact it is usually dangerous, unpredictable and inconvenient. Locating fine material is difficult, depending on a combination of trusted connections and luck. It also takes considerable expertise, since buying rough stone requires even more experience and skill than buying cut and polished gems. The export and import logistics can also be a real headache, worse than the tropical diseases which are usually avoidable. A good haul of fine gems makes all the expense and effort worthwhile. There is also the satisfaction of knowing that our business helps miners and brokers in the producing countries. 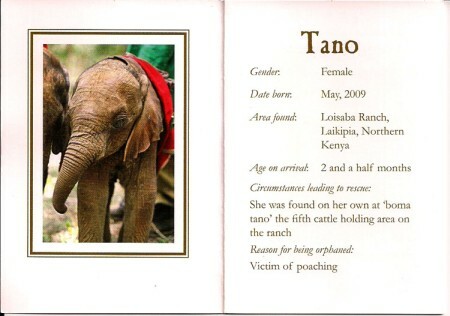 As a way of giving back to East Africa, AJS Gems has adopted an orphaned baby elephant named Tano whose mother was a victim of poachers. This is part of a program of the David Sheldrick Wildlife Trust, which is dedicated to the protection and preservation of Africa's wilderness and wildlife. This month we feature new aquisitions to our collection, many of them from East Africa. Click on any photo for details and pricing. Tanzanite has become a very popular gem, but most of the material in the market is of indifferent quality. But this 9.41 ct cushion cut is is a fine example of top grade tanzanite, with a saturated deep violet blue color. This is a beautifully cut stone in an impressive size with excellent brilliance and clarity. We've graded this gem "loupe clean," our highest clarity grade. See all our fine Tanzanite. Mozambique is producing some of the finest tourmaline in the world. This large pear has a vivid blue green color that is the equal of many paraiba tourmaines, but this gem turns out not to be copper-bearing. Carefully fashioned in a portuguese cut to maximize brilliance, this 15 x 12 mm beauty will make a stunning pendant. Certified by GRS. See all our blue green Tourmaline. Top grade Mahenge spinels have become quite scarce, especially in large sizes. But you'll find very few as fine as this bright cherry-red oval. This is simply a gorgeous gem -- top color, excellent clarity (graded "almost loupe clean") and expert cutting. This gem has remarkable fire and glows even under low lighting. Certified as natural and untreated by GRS, with the color described as "vibrant" pinkish-red. See all our Mahenge Spinel. We are continuing to cut new pieces from our stock of gem silica rough, and recently produced this impressive 26 carat cabochon. This is Peruvian material with a very attractive blue-green color. It displays good translucency and very good luster. Clean pieces in this size are quite rare, making this a true collector's gem. This gem has been certified as natural and unheated by GRS. See all our stock in Gem Silica. We have recently purchased some very nice South Sea pearls from Indonesia, and have just begun adding them to our website. South Sea pearls come from the area between the northern coast of Australia and the southern coast of China, and are among the largest cultured pearls in the world, with sizes typically between 12 and 20 mm. We have some fine rounds, like the matched pair shown here, as well as a number of baroque pearls popular with jewelry designers. See all our fine Pearls. The finest spessartite garnet we've seen in recent years comes from Nigeria. Unfortunately that deposit is now exhausted. But we found some outstanding spessartite in Tanzania, though only in smaller sizes. These are pure orange, exceptionally clean and bright, with amazing fire, like the 1.70 carat stone pictured here. See all our Spessartite Garnet. With the steady progress towards reform in Burma, we knew it was only a matter of time until the US lifted trade sanctions. But the announcement on May 17th that the US was suspending economic sanctions and appointing the first ambassador to Myanmar in 22 years came as a surprise. Secretary of State Hillary Clinton said Washington would issue a general license to permit US investments across Myanmar's economy, and American energy, mining and financial service companies were all now free to look for opportunities. The ban on the import of Burmese products, including ruby and jadeite, have not yet been suspended, but we expect that this ban will soon be lifted as well. There are a reports of a significant new corundum find in northeastern Madagascar, about 50 km south of Ambatondrazaka. The deposit is in a protected area where mining is not permitted, but reports are that approximately 10,000 Malagasy miners have actively been working gem gravels in and around a stream bed in the jungle. It is impossible for foreigners to reach the mining area, but hundreds of foreign buyers (mainly Sri Lankans) have reportedly set up buying offices in Ambatondrazaka. Quantities of high quality blue, orange and pink sapphires have been found, as well as fine ruby. The latest reports are that the government has now put a stop to the illegal mining and cleared miners from the area, but it is likely that mining will resume in some form, either due to lack of government control or corruption. Tanzanite is the violet to blue form of the mineral zoisite. Zoisite naturally occurs in a range of colors, including brown, pink, yellow, orange, green and blue. Blue zoisite is fairly rare and most of the blue specimens have a strong gray secondary hue. However, zoisite tends to turn blue when heated at low temperatures, and some material turns an intense violet blue that is unique in the gem world. This is why 99% of the tanzanite in the market has been heated. Unlike sapphire or ruby, there is no premium on unheated tanzanite. Value depends on color and clarity, and the most saturated violet-blue color is the most valuable. The way we use these terms, both "unheated" and "untreated" mean "no treatment whatsoever." The term "unheated" is often used in the trade to designate untreated specimens of gem varieties such as ruby and sapphire, which are routinely heated to improve their color and clarity.